Dove is a 2001 3/4 Friesian cross with loads of personally. His majestic presence will add that “special touch” to your event. He loves attention and is sure to capture your heart with his interested nature. Fuze’ was born in 2012 and is a pure bred Friesian. The Friesian Horse, with flowing mane and tail, originated in Friesland, a province in of the Netherlands, Always black in color, the Friesian is one of the oldest European breeds, dating back to 1000 BC. This noble horse was a favorite mount of armored knights, having strength to carry great weight and still maneuver precisely in battle. 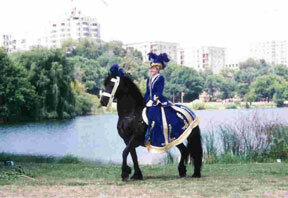 The breed association’s slogan is The Friesian Horse, Experience the Enchantment. Hence, The Enchanted Carriage was the name given to our company. The Friesian Horse; Bold, Romantic, Majestic. Whatever the occasion, celebrate with the romanticism of the Friesian Horse. Fuze still needs time to grow before he will be ready to perform. He has already begun his training. Reno came to the farm in the spring of 2003. I wasn't looking for another horse, but I received a call from Amish trainer, Vernon Miller. He had a 23 year old gelding that he needed to place. He wanted this horse to go where he would be well taken care of in is last years and he called me. How could I resist? Reno worked as a carriage horse in Chicago for five years so he was well trained and traffic safe. For the next six years Reno enjoyed his semi retired life, participating in wedding celebrations, parades and other special events. This little mare was the reason we started The Enchanted Carriage. During her time on the farm she delivered five babies and performed in several events and shows. She had a heart of gold and never quit. Peitje will be sadly missed. 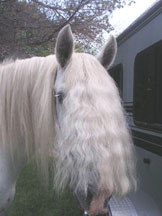 Sugar Baby was an English Shire. She was used as a brood mare by her previous owners who where told she was trained to drive. She was too sick to try her out before we took her in. With sores covering her legs and very underweight she became our “rescue project”. 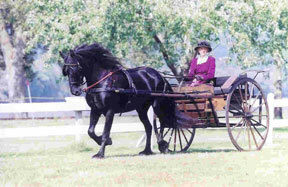 Several months of rest and 400 pounds later, Sugar began her career of carriage pulling. Sugar lived on our farm for seven years. Losing a beloved horse is always painful and I ask myself if the pain is worth it. Yet I could not imagine my life without these special horses and am thankful for the privilege of loving them. I received a card which read "I still miss those I loved who are no longer with me, but I find I am grateful for having loved them. The gratitude has finally conquered the loss."